A Notary verifies and acknowledges the identity of the person signing a document. When required, a Notary can also give an oath and certify that the signer swears to or affirms they believe the contents of a document is true and correct. Notaries can also certify a copy of a power of attorney by comparing it to the original, and providing a certificate of examination. A certified copy of a power of attorney has the same force as the original document. A few local companies provide Notary services during business hours at their office. 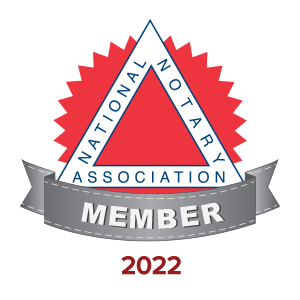 A Mobile Notary is a Notary that travels to your home, office, hospital, or wherever you feel most comfortable to sign your legal documents before, during, or after regualar business hours. I bring my office to you with all of the neccessary supplies to take care of your notarial needs. Call/Text (760) 753-1393 or Email me today to make an appointment. I am available anytime by appointment, but I stop making appointments at 5pm for same day services. My Loan Agent Signing fee is $150. Price includes confirming the appointment with the signers, edoc retrieval, 2 copies of up to 150 pages printed on a laser printer in letter/legal sizes, document review and preparation, travel up to 30 miles round-trip, general summary presentation of documents to signers, all notarizations, all signatures double checked for accuracy, 1 witness when required, report of status after the appointment, return delivery by scan/fax (if required), and drop off at shipping location with customer provided shipping label. For a less fee, less services will be provided. * eSignings include all Loan Agent Signing services above, plus use of technology (i.e. iPad, laptop, wireless data, etc.). Any signing date other than the date of signing. Previous dates or future dates are strictly prohibited. Again, notary journal enteries are in chronological order. Documents are dropped off at specified shipping companies with locations that provide receipts. Packages are never left in drop off boxes, unless required for late pickup situations. Every attempt is made to drop documents off for next day delivery. FedEx - Pick up is once a day at 4:30pm (M-F) and 4pm (Saturday) for next day delivery. UPS - The last pick up is at 5:00pm (M-F) and 1pm (Saturday) for next day delivery. GSO, Norco, and OvernightExpress Drop Boxes - The last pick up is at 8pm (M-F) for next day delivery to every address in California, select regions of Western Nevada, Arizona, and New Mexico. Monica Johnston provides mobile notary and loan signing agent services in San Diego County, Escondido, California. Call/Text or Email for an appointment. Same Day Service requests ends at 5pm. © 2015-2019 Notary Services by Monica. All Rights Reserved.